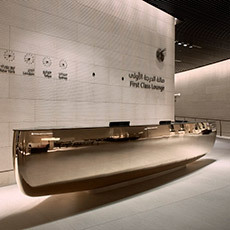 For the VIP lounge of the New Doha International Airport the Studio ACPV has designed large reception desks with mirror polished bronze finishing. Realize has produced them. They have long shapes, ovoidal shape, lanceolate, apparently easy but, at an attentive look, they reveal changes of section and complex connections which challenge each geometry. The supporting structure is a stainless steel skeleton with the necessary strength to support huge tensions due to weldings of the external bronze sheet. The top board is in polished black colour Corian while skirting and behind footboard are in stone. Counters length is 6 and 8 meters, according to the type, and lay on the only central part leaving raised the two heavy extremities. In these shapes we can read the strictness and the refinement of the italian design but also to find the characters of the great sculpture of the twentieth century; a name above all the one of Constantin Brancusi.